This post does not center around a city or town, but William Least-Heat Moon (LHM) stopped here along the Kentucky River to talk to a man about a boat. I wonder if they ever finished it (this was 1978 after all). Click on the map to discover where you can find the oddly named Brooklyn Bridge and the Kentucky River Palisades. "The highway, without warning, rolled off the plateau of green pastures and enterred a wooded and rocky gorge; down, down, precipitously down to the Kentucky River. Along the north slope, man-high columns of ice clung to the limestone. The road dropped deeper until it crossed the river at Brooklyn Bridge. The gorge, hidden in the tableland and wholly unexpected, was the Palisades. At the bottom lay only enough ground for the river and a narrow strip of willow-rimmed floodplain." Nowhere, as I researched why the Brooklyn Bridge over the Kentucky River is so named, could I find an answer. I've been presented with a mystery. Perhaps some reader who stumbles across Littourati can leave a comment and enlighten me. Of course, we have the world famous Brooklyn Bridge across the East River that connects Manhattan with the bridge's namesake borough across the river. Interestingly enough, a bridge that connects Cincinnati with Kentucky, known as the High Bridge, was designed by John Roebling, the designer of New York's Brooklyn Bridge. When the High Bridge (now known as the John A Roebling Suspension Bridge) was completed in 1866 it was the longest suspension bridge in the world. But the Kentucky River Brooklyn Bridge is a mystery. Was it so named because, in that part of the country in 1871, it looked like a monumental achievement and on a par with the New York Brooklyn Bridge, then under construction? Did locals simply refer to it as their Brooklyn Bridge, and the name stuck? Considering that it crosses at a place where there aren't any major metropolitan areas, the siting of the bridge itself seems to me to be a mystery. The Palisades, however, are no mystery. Having not been to this part of Kentucky, I have never seen them, but the photos look beautiful. I have seen similar rock formations in different parts of the country, but evidently the river and these formations stand out, especially in the fall when the leaves are changing. LHM spends little time talking about the Palisades, however. He's more interested in a boat he sees being built down along river. He seeks out the builder, and finds an older, retired man and his wife who have invested their time, energy and sweat into building a boat that they hope will one day allow them to cruise the rivers down to the gulf. Not being a seafaring type myself, partly because I seem to get seasick any time I am on choppy ocean water, I can still understand this call. Both of my uncles were commercial fisherman (one is now deceased but the other is still fishing in his 80s), as was my grandfather, and the ocean was in their blood. There is something between a captain and his boat. The captain loves his boat as if it were a spouse. LHM describes it well in talking with the builder, a man named Bill Hammond, and his wife Rosemary. He sees a sign above the kitchen table which reads "A boat is a hole in the water surrounded by wood into which one pours money." Rosemary adds "....And your life." I remember my Aunt Betty, when my Uncle Elwin was out on the water up in Alaska, waiting for the radio to crackle so that she could make sure that he was all right. It's every fisherman's wife's fear that she will learn that something happened to her husband in rough seas, that the boat went down. Fortunately, that never happened because my uncle was a careful captain who made sure he and his crew were safe. My other uncle, Bob, still takes his wife fishing with him. If you're the spouse of a person who lives and loves boats, you have to indulge them, if not buy into their dreams. 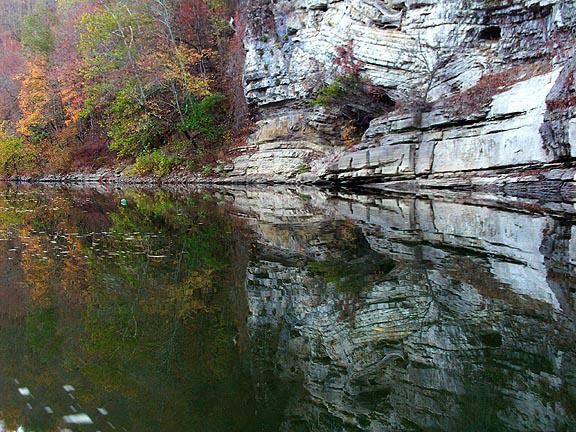 I wonder if Bill Hammond ever completed his boat, Bluebill, and if he and Rosemary sailed away down the Kentucky River, below the geological columns of the Palisades silently standing and watching as they have for eons, to the Mississippi, the Gulf and beyond? I hope they achieved their quest. Did you ever find out about the boat. Just reading the book for the first time, 30 years later! Brooklyn bridge is so named after the Village of Brooklyn which was named after Col. Brooks shortly after he established a landing after floating down river via raft. It became known as Brooks Landing, later know as Brookland. Over time it was shortened moreso to Brooklyn. More can be found looking through the Jessamine County Historic Society. Bill and Rosie did in fact complete the build, but not without great sacrifice. When LHM visited, the Bluebill was keel up as the hull was being completed. Shortly after completing the hull work, she was flipped upright just in time to prove her seaworthiness. The Kentucky river flooded the lowland where she sat on her supports, and floated her off them and into the river. Fortunately, as the floodwaters receded they were able to secure her and continue the build. Bill and Rosie, with help from friends and other "river rats", spent 13 years getting far enough along to launch the Bluebill. Cranes were donated to lift her from her drydock, and what a sight it was as first her bow appeared through the trees, and then they swung her broadside and eased her down into the river. Unfortunately. Bill's health had been declining for some time. After years of smoking, and a lifetime of welding and fabricating, Bill developed emphysema. On the day of the launch he was brought down to the riverside by Benny Powell in an open air car that Benny had built, a replica of a Model T. Bill was on oxygen, and didn't have the strength to make the walk. A joyful but sad day. The Bluebill was moored at the Palisades for 2 years as Bill's health improved slightly, and when the fitting out was completed they took her down the Kentucky to a marina on the Ohio, near Vevay Indiana. I wish I could remember the dates, but can't say for sure how long they were there before Bill's health deteriorated to the point of needing more care than Rosie could provide. He was placed in a nursing home, and the Bluebill was put up for sale. I had the honor of piloting her on the Ohio twice, once for a prospective buyer. The Bluebill was sold, I believe to a pilot living in the Cincinnati area. All of this took place during the mid- to late '80s. Bill is gone now, and I am not sure about Rosie. But seeing this mention of the Bluebill has sent me looking for her. Thank you, Terry Stevens, for your recollections. As a cruising boater on the NC coast for many years, and currently reading "Blue Highways", I too became interested in learning what became of these obviously fine folks (the Hammonds) and their vessel, "Bluebill". Your post, here, was hugely informative in itself. There's another poster's link, above your post, that I believe should take you to portions, if not all, of a subsequent and more recent work, "Blue Highways Revisited" (different author), that tells in small part of Rosemarie's whereabouts in 2009, if you hadn't by chance noticed it. Through some brief research I had stumbled upon this work on Google Books online, prior to the reference, here, and found it to be further enlightening. you have posted an entry twice! Rosemary passed away in 2012. The boat hasn't been seen for years, nor can we find recent record of her being registered any longer. We would love to find BlueBill again. Last known, she was sailing under the name Blue Skies. I have great memories of being around during her construction and then being able to cruise on her as a young child. I was searching for some info on the Bluebill and found this posting. I was a crane operator for Duncan Machinery Movers out of Lexington, KY and I was sent to Palisades and turned the hull over when it was completed. I returned later with a rigging crew and two large cranes and launched the boat into the river. I remember that Bill couldn't stay while we worked because of the diesel fumes from the cranes. He was a really nice guy and I was saddened when I heard he had died not long after finishing the boat. I retired after 43 years with Duncan Machinery last year and have made 100's of trips by there through the years and always look at the spot where the boat was built as I drove by. Truly a sad ending to a beautiful story. This has been an amazing story. I am traveling that way today with my dad. I will tell him of this story.